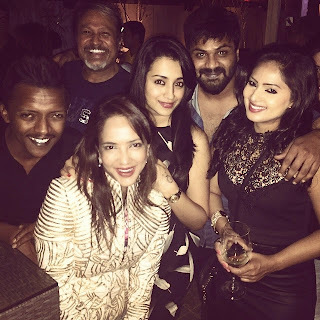 Here is the Exclusive pic of Manchu Lakshmi Prasanna and Manchu Manoj at Trisha's Party. Its known that Trisha god Engaged to Big Business Man Varun Recently and she is now in a party mood who is giving separate parties for all her Industry friends. Trisha's Upcoming film in Tollywood is Balakrishna's LION. Here you can see the pic of Trisha with her best friend and Manchu Lakshmi Prasanna, Nikisha Patel and Manchu Manoj Kumar which was shared by Manchu Lakshmi Prasanna on her Facebook wall.